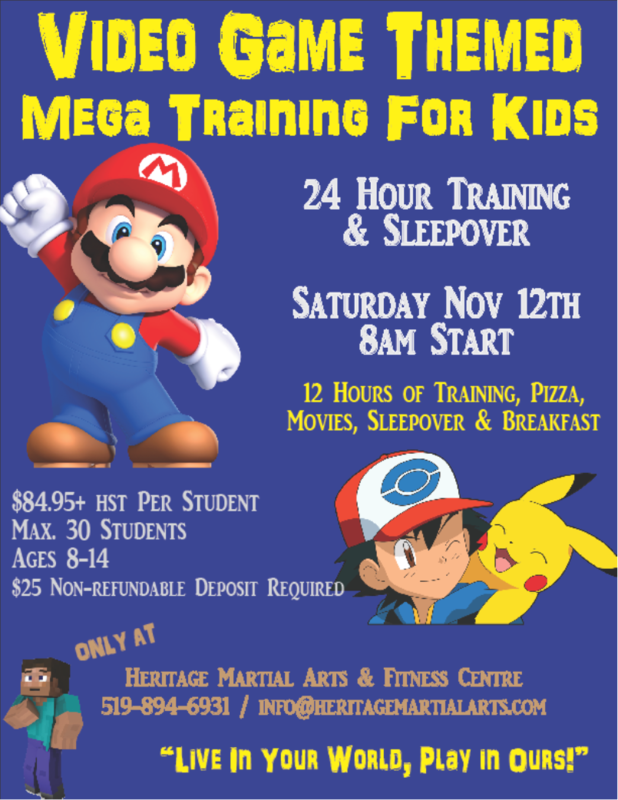 Join us on Saturday November 12th for our Annual Fall Children's 24 Hour Training & Sleepover Event! This year's theme will be "Video Games". A full day of training themed around popular video game scenarios, characters and themes. Then pizza, movies and a sleepover in the dojo! Limited spaces available. Must be between ages 8-14. $84.95 + hst to attend ($25 non-refundable deposit required). Inquire at the office for more details or to hold your spot! Celebrating 20 years in 2017, Heritage Martial Arts & Fitness Centre offers a variety of classes for all ages and abilities and is committed to having everyone achieve their personal best. Whether your goal is learning an art, getting fit or just having FUN – we can help you do it all! Heritage Martial Arts & Fitness Centre Inc.